A student at the University of Illinois in Champaign-Urbana was charged with murder this week, after she turned herself in and showed authorities the body of a newborn in her back-pack. Authorities say Lindsay Johnson – 20 years old from Monee – suffocated her son last month after giving birth to him in a dorm bathroom. 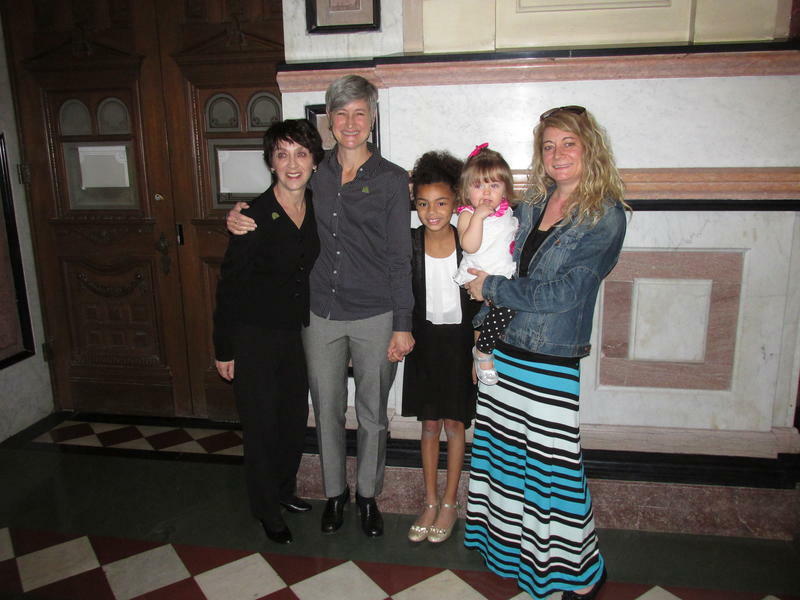 Trinity Haack was probably the youngest advocate at the statehouse on Wednesday. At 16 months old, she was there with her brother and parents. The family had made the trip from Roselle in northern Illinois, and spent several hours in Springfield, speaking with journalists and legislators. Every state in the country now has a some version of what’s commonly referred to as the Baby Save Haven law – over 3,000 babies have been surrendered anonymously through it. In Illinois, as long as the child is 30 days old or less and has not been abused, the parent can leave the baby at a designated location; a hospital, police or fire station, without fear of arrest or prosecution. The law went into effect in 2001, and over 100 babies have been relinquished to adoptive families since then. For our state – there was one woman who got the ball rolling. Dawn Geras is president of the Save Abandoned Babies Foundation – based in Chicago. She says what inspired her to spearhead the legislation was: “Actually similar to the story that just broke in the news about the U of I student, there had been another situation like that, and that morning I was sitting reading about it in the newspaper and it just hit me, and I started crying.” Geras not only helped get the legislation passed, she still works on a volunteer basis with her organization on education about the law. She says she especially hopes it is taught in public high schools’ health classes around the state, as it is supposed to be. The law keeps the baby out of foster care and lets them go directly to one of the hundreds of adoptive families in the state waiting for a newborn baby. Some of the families wait several years for the phone call telling them one is available. Lorie Millar-Nicholson from Champaign and her wife had been waiting for nearly two years when they got the phone call that a baby girl had been surrendered through the law and was waiting at a hospital for them to pick up. Millar-Nicholson’s daughter, Aidan Jane, is now an 8 year old – one with a normal life, who loves reading Harry Potter books. Her two moms are the only parents she’ll ever remember, but even at her young age she gives credit to her birth mother for making a hard choice: “I obviously wouldn’t be here today if my (birth) mom hadn’t made the right choice and dropped me off at the hospital,” she says. Advocates of the law, like Aidan Jane’s mom – hope that with more education about the option of anonymous surrendering of a newborn, there will be no more infants murdered by distressed mothers. A link to the original story can be found by clicking here.